Deanna & Emily talk to the beautiful Manager of YouTube talent: Sarah Weichel. She teaches them about being a social influencer, the different kind of verticals on YouTube, and what kind of YouTube channel she would start. 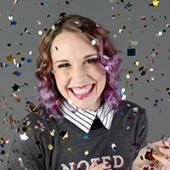 Sarah manages YouTube greats: Hannah Hart, Flula & Lilly Singh aka Superwoman and more. Plus, Sarah gives Deanna & Emily tips on how to work on their SEO (search engine optimization) for OMFG! Hey CBB fans! We are working on a CBB calendar and need some funny CBB-ish names for the following months. - April - May - July - Sept - December Hit us with your ideas! And happy almost Auggy-doggy! Episode 64 - What Is Orthorexia? The delightful Katie Dalebout of The Wellness Wonderland joins Deanna and Emily this week to discuss some important issues including her experience with orthorexia, an obsession with eating foods that one considers healthy. Deanna & Emily recall their relationship to food when they were in their 20's. And how now they worry more about #WRINKS and #CREASES then #CALS and #CARBS. Katie takes us through her journey and shares how she overcame her health obsession. Hey everyone! The Earwolf forums will be getting a facelift on July 4th that may result in the site being unavailable for a few hours. We also may need to make changes once the main update is done that could result in things looking funky for a day or two. But when they are back and running they will be all updated and new users will finally be able to join again! Thanks for your patience and get ready for the Earwolf Forums v2.0! !